Dr. Sujuan Ba currently serves as President and CEO of the National Foundation for Cancer Research. 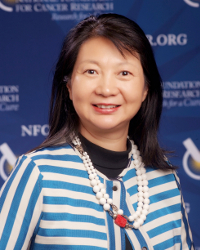 She is the founding President and CEO of the AIM-HI Translational Research Fund, and the Founder and CEO of the Asian Fund for Cancer Research. In addition, Dr. Ba co-founded and serves as a founding board member of the Global Coalition for Adaptive Research (GCAR), the organizing body leading the global implementation of GBM AGILE, a groundbreaking adaptive clinical trial initiative designed to produce new and better treatments for glioblastoma multiforme, a fatal brain cancer. Dr. Ba led the establishment of NFCR’s annual Szent-Györgyi Prize for Progress in Cancer Research, an international prize in recognition of outstanding scientific achievement in the war against cancer. She has served continuously as co-chair of the Prize Selection Committee which consists of leaders in academic and pharmaceutical sectors. The prize has now grown into one of the premier cancer research awards in the world. She is also the former President of the Chinese Biopharmaceutical Association, and serves on the International Consulting Committee of the China National Research Center for Translational Medicine (Shanghai). She also sits on the Scientific Advisory Boards of Medelis, Inc. (Fountain Hills, Arizona) and Immunicom Inc. (San Diego). Dr. Ba is a member of the Editorial Board of the Chinese Journal of Cancer and formerly served on the Membership Committee of the International Union against Cancer (Geneva). She also belongs to BayHelix, an invitation-only organization of leaders of Chinese origin involved globally in life sciences and health. She was recognized in 2017 by the Chinese Medical Doctor Association for her outstanding contributions to international cooperation. She was named as one of the “Top 300 Women Leaders in Global Health” in 2015 by the Graduate Institute of International and Development Studies’ Global Health Programme. She was awarded the 2014 Public Service Award from the Chinese Biopharmaceutical Association–USA for her long term devotion and distinguished service to the global biopharmaceutical community. In 2011, she was selected to receive the CRS WOMEN IN SCIENCES award. Learn more about Dr. Sujuan Ba. Your ticket for the: Sujuan Ba, Ph.D.